Engineering naturally reflects many aspects of wider society. Gone are the days when you bought just milk. Now choosing milk involves deciding between low fat, reduced fat, full fat, organic, soya, almond, lactose free… etc. This choice can be time consuming when made by oneself but it does not take much imagination to see the time and issues that materialise if the decision needs to be made by a group where the issues are multiple and complex. Engineering too has moved from a Brunel-era of the Engineer knows best and will decide, to current complex projects where a multitude of stakeholders all have a view on a myriad of issues affecting the project and its development. Many of these stakeholders wield considerable power and influence and their views need to be somehow included in the choice of a preferred option for a projects development and usually at the earliest juncture. Failure to include such views will generally lead to a build-up of resistance or opposition to the project. 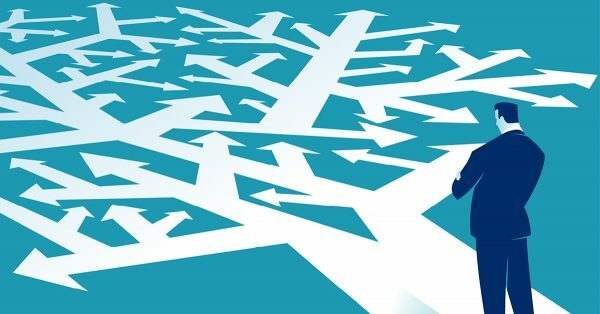 Thus, in an early concept stage there is frequently a problem where the consultant has many options, multiple criteria to judge them all by and no clear idea of which option may be the best or should be preferred, or of how even to begin to choose. This situation is exacerbated by the need to ensure that all stakeholders understand the process of how the final choice is made so they can accept and buy into the finally selected option. In such a situation some projects can become paralysed, or in an attempt to make progress run the high risk of upsetting stakeholders that feel they have been marginalised, ignored or disrespected. For a large oil and gas project subject to a typical gated development process (as shown in Figure 1), in the ASSESS stage, developing a number of options for the projects development is a critical element of this phase of work. As many options as possible need to be developed so that a full range of possible solutions is represented within the option set. However, with many possible options and multiple criteria, the process of choosing becomes geometrically complex. In order to move the project onto the SELECT gate stage it is necessary to evaluate the options and make a selection. It is not an overstatement to say that this is the critical moment for many project’s development. The selection of a particular option ‘locks-in’ much of the projects cost and although optimisation is sometimes possible, the potential to save costs is often limited. In addition, the later changes are made in a projects development, the more costly in terms of time and money it is to make changes to design. So the problem then is – how to proceed and in such a way as to garner support for the final choice of option? The evaluation should involve a procedure that balances as far as possible the competing requirements and demands on the project to select the optimal solution. An optimal solution is one that satisfies the critical requirements of the design and project objectives, stakeholder constraints and any further applied external demands. Additionally, the procedure should be sufficiently open-book and participative to ensure that with any stakeholder who may still object, they can however acknowledge that the process has been objective and open, with the reasons for choosing the selected option visible against the other options considered. Finally, the procedure needs to be flexible to adapt to changes in thinking by the evaluation team. Many evaluations are carried out ‘live’ during a large meeting, with mixed consultant-client teams and if there is agreement made to, for example, change criteria during the process (a common occurrence), and then the procedure must be simple enough to allow this to occur. Multi Criteria Decision Making (MCDM) is concerned with structuring and solving decision and planning problems involving multiple criteria. Typically, a unique optimal solution does not exist for such problems and it is necessary to use decision-maker’s preferences to differentiate between solutions. “Solving” can correspond to choosing the “best” alternative from a set of available alternatives (where “best” can be interpreted as “the most preferred alternative” of a decision-maker). The difficulty of the problem originates from the presence of more than one criterion. MCDM is appropriate to much early phase engineering study work by Penspen that involves a large range of criteria and options and where a formal and objective analysis is required which is impartial. MCDM fulfils this requirement. Within Penspen I have used it on multiple occasions where there is a matrix of options and criteria with multiple stakeholders. Some typical uses have involved choosing between pipeline routes, selection and sequencing of countries for pipeline extensions and selecting best options that will improve a projects value. It is most useful when the differences between options are subtle and there is a need for an ‘open-book’ process to secure stakeholder buy-in. 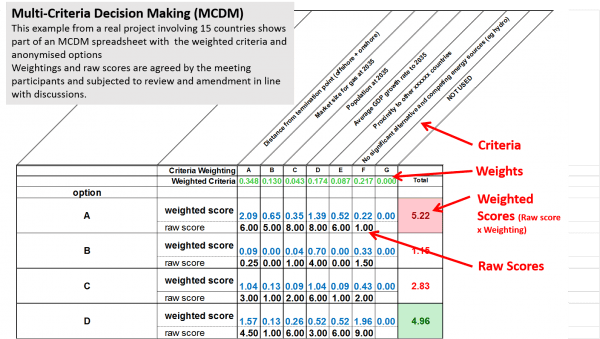 An example of a MCDM spreadsheet for a project is shown in Figure 2. Thus, using a suitable technique, the potentially problematic and difficult issue for a consultant of guiding a client and other stakeholders through a minefield of choice, can be turned to an opportunity to demonstrate key management skills that help a client to make an optimal and informed choice that has the best possibility of keeping all parties happy – the best choice of all.